Evleaks gives peek of a possible Windows Phone, powered by "laptop class Intel chip"
Rumors of a Surface phone, built and sold by Microsoft to replace the dead Lumia brand, have been all but confirmed and this could be that device. On one hand, it’s hard to get excited about Windows Phones announcement when their market share of mobile is almost non-existent at this point. With Android taking over 87%, iOS a distant second, with just under 12%, Windows Phone is just existing at 0.4%, down significantly from an already insignificant 1.8% in 2015. On the other hand, stagnation in the world of mobile and two recent flagships from Google and Apple being arguably stodgy, anything even remotely unique is welcome. Unique in this case being a phone that has the same internals that power modern laptops — and that, is exactly what Evan Blass, known as @evleaks on Twitter, seems to be hinting at in his recent posts. Rumors of a Surface phone, built and sold by Microsoft to replace the dead Lumia brand, have been all but confirmed and this could be that device. With HP selling their well reviewed, high-end Elite X3 against virtually no competition, the opportunity to release a killer device is wide open. The device pictured is nothing short of gorgeous and has some similarities to previous blocky Lumia devices and the Nexbit Robin. Giving me pause however, is the final photo of the gentleman in the back of the car using his phone and laptop, presumably over Continuum. The phone in that frame is clearly different from the ones in the other photos, with different bezels and rounded corners. That may be nothing, or it might be a red flag exposing the whole thing as being fake, despite Evleaks having a really… really good track record. The other question is Blass’s statement of the phone relying on a “laptop-class Intel processor.” That could really mean a lot of things. I would be amazed if some form of the Intel Core chips made it inside this phone so let’s keep our expectations grounded. Having said that, Intel has been getting crushed by ARM chips in this space and may have a trick up its sleeves to attempt another charge at mobile. We should hear more about this mystery phone soon as Blass states it to be much more than just a concept. 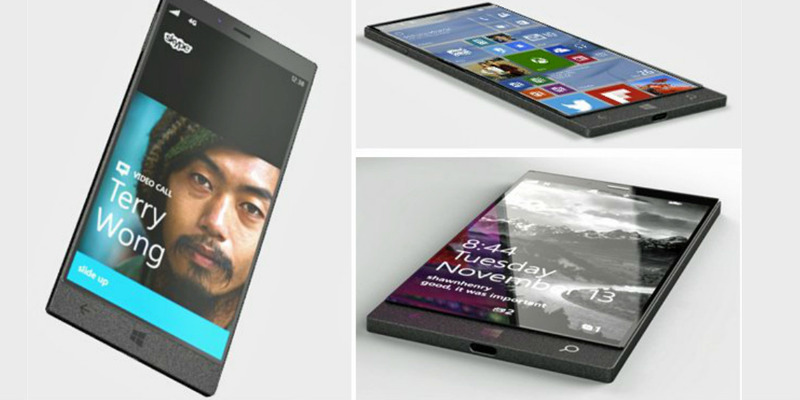 What do you think of these Windows Phone possibilities? Tell us in the comment section below, or on Google+, Facebook, or Twitter.